Accurate projections of lifetime earnings are useful in projecting Social Security benefits, trust fund balances, and economic resources of the elderly and the effects of changes in Social Security policy. 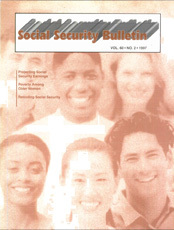 This article projects lifetime Social Security earnings until retirement using data from the Survey of Income and Program Participation (SIPP) matched to Social Security records of annual earnings from 1951 through 1993. We first develop, estimate, and test gender-specific multiple regression models of 10-year earnings intervals using the matched 1984 SIPP panel. We find strong relationships predicting the mean indexed monthly earnings level in the 10-year period of 1984-93. We then use the models to project (unobserved) Social Security earnings from 1994 through retirement for persons born between 1931 and 1955. By adding projected earnings to observed annual earnings to date, we forecast lifetime Social Security earnings for persons retiring early in the 21st century. This article focuses on the relationship between women's economic status earlier in their lives and their poverty status in old age. Previous research on the determinants of poverty among aged women has documented the socioeconomic and demographic correlates of the poor, and has examined the financial impact of adverse later-life events such as widowhood, deterioration of health, and loss of employment. Using data from the National Longitudinal Survey of Mature Women (NLSMW), we find that most women who experience these types of adverse events in their later years do not become poor and that a large majority of older NLSMW respondents who were poor in 1991-92 were poor earlier in their adult lives. Whether women are impoverished by adverse later-life events depends on their economic resources just prior to the event. But, the financial resources available in old age, in turn, depend very much on their long-term economic status throughout much of their adult lives. This article underscores the fact that for most older women, these adverse events do not appear to precipitate poverty spells—at least not within the first couple of years—and directs attention at longer term circumstances that make some women more vulnerable to poverty. Because of the imbalance between promised benefits and available taxes, some reform of Social Security is inevitable. At the same time, perceptions of Social Security are changing rapidly as it moves away from a system where all recipients—whether rich or poor—received more in benefits than they paid in taxes, and where those who were richer consistently received larger net transfers than those who were poorer. Reform is most likely to succeed if it returns to basic principles such as progressivity, equity, and efficiency. Although these principles sometime conflict, they also provide much common ground. For example, if Social Security is meant to meet the greatest needs of the elderly, then increasing the retirement age (which mainly affects the younger and richer elderly) would be preferable to removal of the cost-of-living adjustment (which mainly affects the older and poorer elderly). Efficiency and equity principles, in turn, call attention to some groups—second earners in household, those with few employee tax preferences, those who work many years, and elderly workers—whose net benefits are lower than others who should have less claim to Social Security resources.